Usually characterized by round or oval patches of hair loss, alopecia areata is an illness that affects both males and females of all ages. It not only affects person’s appearance, but also confidence and self-esteem. Although symptoms and causes of this autoimmune disorder (the immune system attacks the hair follicles) are well researched, not much can be done to reverse or stop it. There are indeed numerous treatments available, but aside from hair transplantation (surgical procedure), all available treatments can only slow the hair loss process. Yes, there are numerous treatments for this illness, but since we are daily bombarded with healthy tips, everyone is looking for a natural hair loss solution. Majority of people who suffer from alopecia areata want to avoid surgical procedures and opt for something less painful, such as homemade remedies, 100% organic hair products, etc. 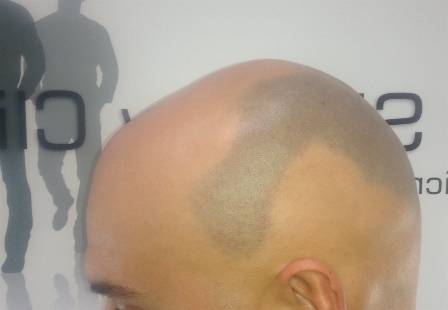 One Alopecia Areata natural treatment that has been considered highly effective is the micro scalp pigmentation. Micro scalp pigmentation is a special type of art tattooing. This procedure is performed by experienced professionals who have tattooing skills. Patient’s head is tattooed with tiny dots to create an appearance of a head full of tiny hair. Only natural pigments that match the colour of patient’s natural hair are used. The micro scalp pigmentation is a non-surgical and non-invasive procedure, which delivers immediate results (visible results even after first treatment). It is a painless procedure that doesn’t require medications or special treatments. Fluoric Acid: A homeopathy medicine made from hydrofluoric acid. It works wonders for alopecia areata and is highly recommended by homeopathy doctors. Sepia: This type of homeopathy medicine is used for a spectrum of health problems, including alopecia areata. It is prepared by using the inky juice of the Cuttle fish, and can be used also for treating other types of hair loss problems, such as after birth hair loss and hair loss due to menopause. Onion extracts. Crush onion and extract the juice. Apply the juice on the bald areas by using a clean cotton pad. Wait 1 hour and then wash your hair. This simple process stimulates new hair growth. Hair mask made with black gram. Take a cup of black gram and boil it until it becomes soft. Grind the mixture and apply on the scalp. Next morning wash your hair and scalp with water and mild shampoo. Repeat the procedure three times in one week. The results will be new hair follicles on the bald areas.